Arthritis affects an estimated 6 million people in Canada, and 54 million in the United States; it can significantly impact daily activities, work, relationships, school and the way people see themselves. With over 100 types of arthritis affecting people of all ages, the patient community is incredibly diverse and so are their experiences. How has arthritis changed your world? Tell us if you would like your name (or Twitter handle) and age attached to your quote, or if you would like to remain anonymous. 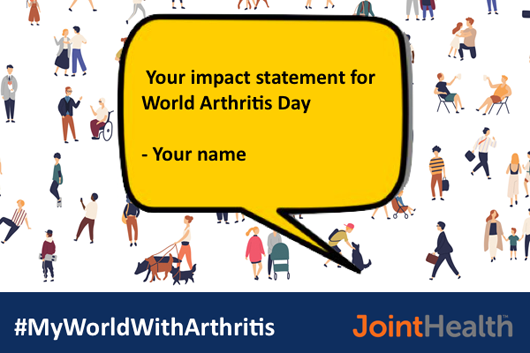 You can also participate by sharing your experience on your own Facebook and Twitter page by using the hashtag #MyWorldWithArthritis. Follow our Facebook and Twitter page on World Arthritis Day to understand how arthritis impacts the world.